Still looking for decoration ideas? We keep them coming with this week's sale. Type SANTA404 when you order and get a 20% discount! 'Twas the night before Christmas, when all through the house, not a creature was stirring, not even a mouse." This warm centerpiece is named after that well-loved Christmas bedtime story. 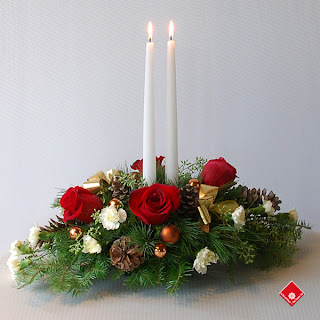 Roses, evergreen, pine cones, and tiny miniature carnations make up the base of this beautiful arrangement, and two tall, thin, white candles give it an air of grace. We've got plenty of holiday decorating ideas where that came from, never fear. Keep up with our sales by checking the banner on our homepage, and following us on Facebook, Twitter, Foursquare, and Google+. Don't hesitate to call your Montreal Florist at 514-938-1234 if you have any questions or requests. Better yet, why not stop by for a visit?